A great vintage 2 full page original magazine ad. Each page measures approximately: 5 1/4" x 7 1/4". Condition: EXCELLENT. 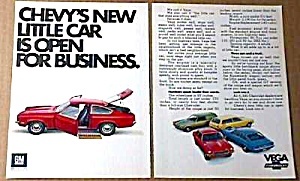 We believe this ad is for the 1971 model as the magazine was dated 10/70. Can't you hear those aluminum blocks cracking?! Such memories we ALL have! Certificate of Authenticity is provided to show that this piece is from an original magazine (not a copy).